A good night’s rest at the Red Butte Ranch Bed & Breakfast performed wonders on our weary bodies, and we awoke anxious for another day of fishing. Two new guests arrived the previous evening from Fort Collins and they were preparing for a day of guided fishing on the river with Greg. Apparently it was their fourth consecutive year of booking a guided float trip with Greg at the end of March. We chatted with them over breakfast and made our plans for the day. Greg suggested giving Fremont Canyon a try as it was between Pathfinder and Alcova Reservoirs and above the flushing flows. He told us that it was smaller water with flows at 75 cfs and the guide shop reported some clients landing monster trout the previous day. Originally Steve and I planned to fish downstream from the B&B and then migrate to the area below the dam; however, we decided to accept Greg’s advice and drive to the Fremont Canyon stretch to start our day. Greg steered us in the right direction on Tuesday, so why not continue to follow his suggestions? Our plan for Wednesday was then to drive west to Fremont Canyon and fish there for awhile or all morning depending on our success. If it did not work out, our default was to return to the area below Grey Reef dam where we’d experienced success on Monday and Tuesday. High temperatures were forecast for the mid-50’s on Wednesday so I was less concerned about keeping my hands warm, but I cracked open a pack of handwarmers nonetheless just to be safe. I placed them in my down vest so I could thrust my hands deep in the pockets inside my wader bib should my hands become cold. Steve and I packed up all our belongings, paid for our lodging, said our goodbyes, and hit the road for our drive to Fremont Canyon. We missed the left turn initially, but did a quick U-turn and recovered from our mistake. A five mile drive on a side road off of 220 led us to a parking lot overlooking the North Platte River in Fremont Canyon just below Pathfinder Dam. We quickly grabbed our rods and descended the steep path from the parking lot down a bank to the river. As Greg described, the river was much smaller in this area but discolored to an olive brown hue. We immediately began drifting our eggs and worms in a nice run below the parking lot. Three or four fishermen were above us in some runs and riffles closer to the dam. I elected to start in the midsection of a long run and Steve began at the top. On perhaps the tenth drift through the soft water on the opposite side of the run, my indicator dipped and I set the hook and felt the weight of a decent fish. Unfortunately it wasn’t as large as it felt because I’d foul hooked the 13 inch rainbow in the belly. 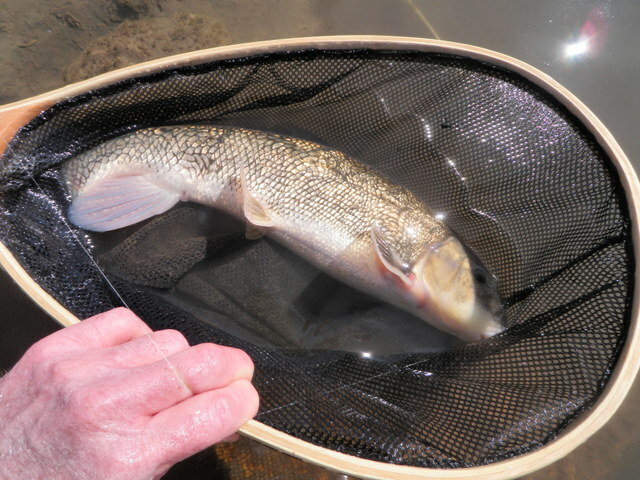 I skimmed it up over the surface of the water and brought it to net and released it. Steve and I continued to prospect the pea soup colored water for an hour or so with no sign of fish other the foul hooked experience. After hooking a fish on practically every drift the previous day, it was difficult to adjust to this new lack of action situation. Finally after an hour of futility, I met up with Steve and we agreed to retreat to the stretch below Grey Reef since we knew that was yielding fish. We ascended the bank and placed our rods in the car and in a short amount of time we were parked in the parking lot below the dam. Quite a few fishermen occupied both sides of the run and pool created by the outflow from the pipe where water was being released from the bottom of the dam. Steve decided to try the near side of the river first where we fished on Monday, but I was intrigued by the idea of crossing the dam and exploring the far side. Greg told us that we could cross on the walkway that spans the dam, and I discovered this to be true. Once on the opposite side I hiked down a well worn path to a spot just above and across from the boat launch area. I had a fuzzy orange egg fly as my top fly and the chocolate San Juan worm on the point. I flicked a cast or two into a short pool and run in front of me and in a short amount of time I hooked and landed two twelve inch rainbows, one on the egg and one on the worm. I was pleased with the instant action after many fruitless casts in Fremont Canyon, but I was spoiled by the size of the fish landed the previous day. Next I moved down to a nice deep run directly across from the boat ramp and began drifting this area, but nothing was happening. After I’d covered fifteen yards of this run I decided that I wasn’t getting deep enough so I added a second split shot, but this resulted in numerous snags so I pinched off one of the beads and returned to one split shot. Finally I decided that this water wasn’t going to yield any fish, so I returned to the pool where I began and moved up to the next nice area above it. 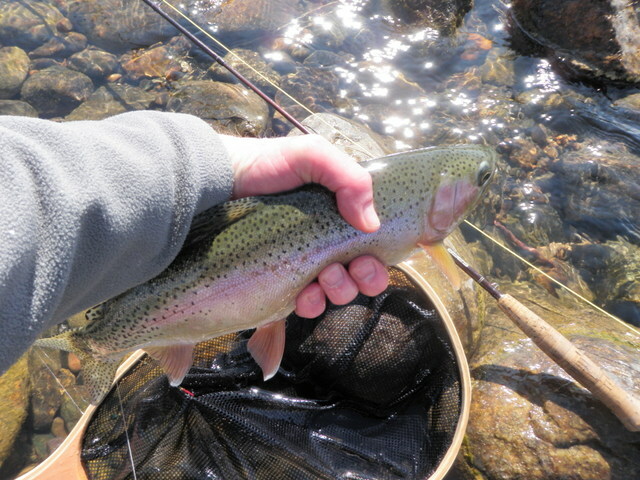 Here I managed to land another moderate sized rainbow. For the remainder of the morning I worked my way back up the river toward the dam. A small long island split the river between the dam outlet and forty yards above where I began, so in a short amount of time I was fishing the smaller left channel. Toward the bottom of this channel I hooked a fish and it felt larger than the earlier hookups. I battled the fish up and down the river a bit and eventually coaxed it to the shallow rocks near my feet and netted a fine 17 inch rainbow. I was pleased with this turn of events and positioned it on a rectangular rock for a photograph and then released it to swim again. Shortly after this and just above in a nice deep run I once again hooked a heavy fish, but it didn’t seem to possess the energy to rip off line in a long dash the way the rainbow had demonstrated. Sure enough as I played the fish and finally brought it up to the net, I realized that I’d hooked a monster 15 inch sucker. After days of catching fat rainbows, it was surprising to hook a different type of fish, but a sucker was not my preferred choice. 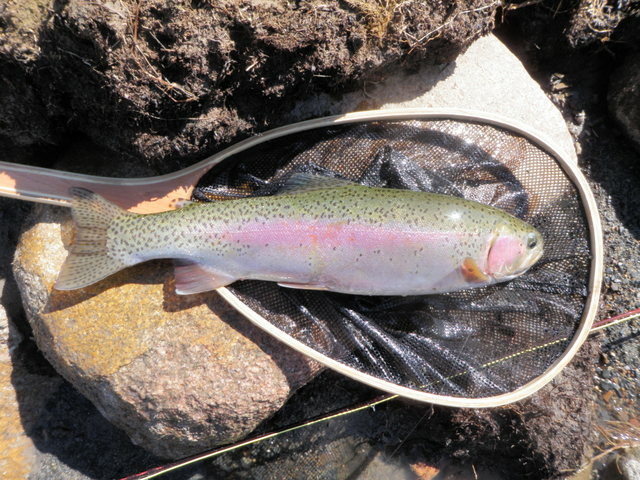 I continued fishing up along the left bank and ended up landing seven rainbows during the morning and early afternoon. Meanwhile Steve had made the walk across the dam, and he was covering the run across from the boat launch with more success than I’d enjoyed. When I reached the pool at the top of the island I was close to a number of fishermen, so I waded back on the bank and walked down the path to Steve. It was now 1PM so we decided to reel up our flies and call it a day since we had a four hour drive back to Denver in front of us. 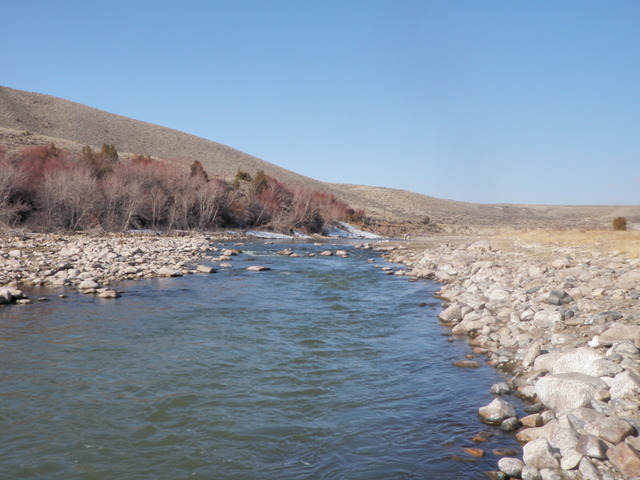 It was another fine day on the North Platte River, and I’m looking forward to a return in the not too distant future.